Wow, these are truly delish. Like, insanely delish. 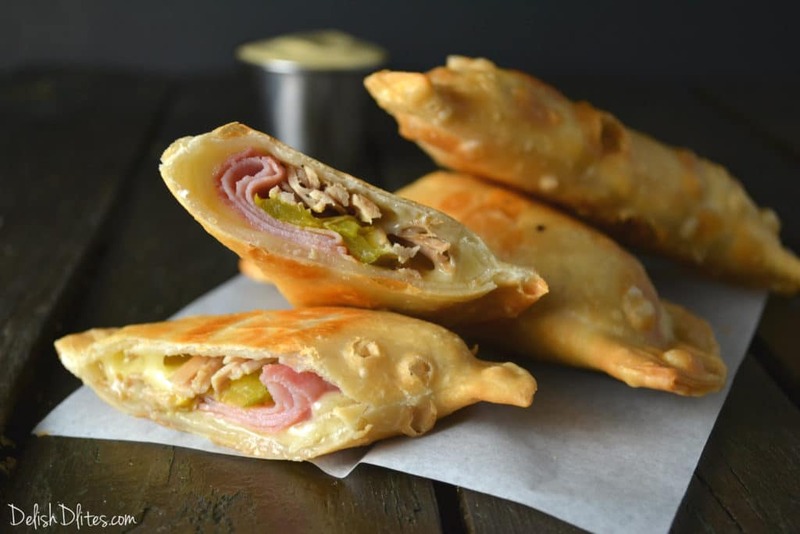 If you love Cuban sandwiches like I do, you’re probably thinking “how can you possibly make a Cuban sandwich even more delicious than it already is?” Well, you can stick it into an empanada shell. The results? EPIC. These funky Cubanadas feature all the trimmings associated with Cuban sandwiches. Swiss cheese, sweet ham, roasted pork, pickles, and a mustard/mayo dipping sauce for good measure. You’ve got it all. 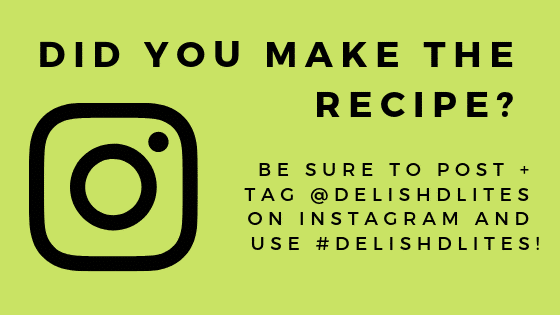 Crunchy, sweet, salty, garlicky, cheesy…I don’t know about you, but I can’t ask for much more in a single food. Make extra. Trust me. As a special note, check out this amazing device that takes the thumb cramps out of empanada making. The Empanada Fork is a godsend to empanada lovers everywhere, and is the creation of fellow New Jersey native, Hipatia Lopez! 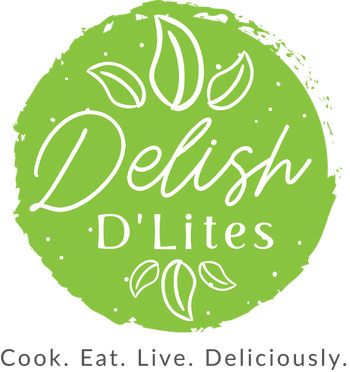 She, like many of us with families who love all things Latin, spent countless days and nights making empanadas for her family. She figured, there must be a better way to close these things up! And BAM! 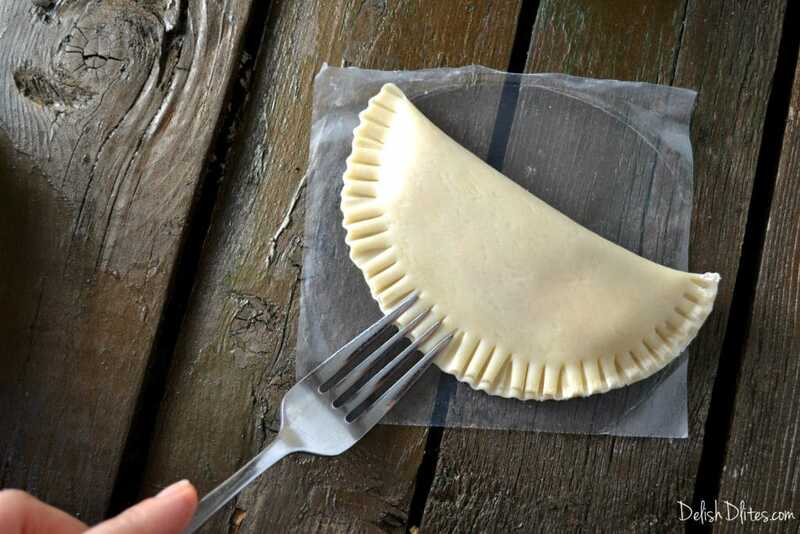 The empanada fork was born. Get yours today at the Empanada Fork website, it not only serves as an empanada sealer, but it’s a great food masher too! Start by laying a piece of Swiss onto the empanada disc. Tear it up into pieces so that it fits inside the disc. You want a leave a border around the edges of the disc, so that you can seal it later. Add half a slice of ham, a bit of roast pork, and few slivers of pickle. Fold the empanadas in half and crimp the edges down to close them up. Heat up about 1 inch of oil in a pan to medium heat. Cook the empanadas for 2-3 minutes per side, until they’re golden brown. Drain the empanadas and allow them to cool for 5 minutes before serving. They’re super hot! To make the dipping sauce, mix the mayo and mustard together. 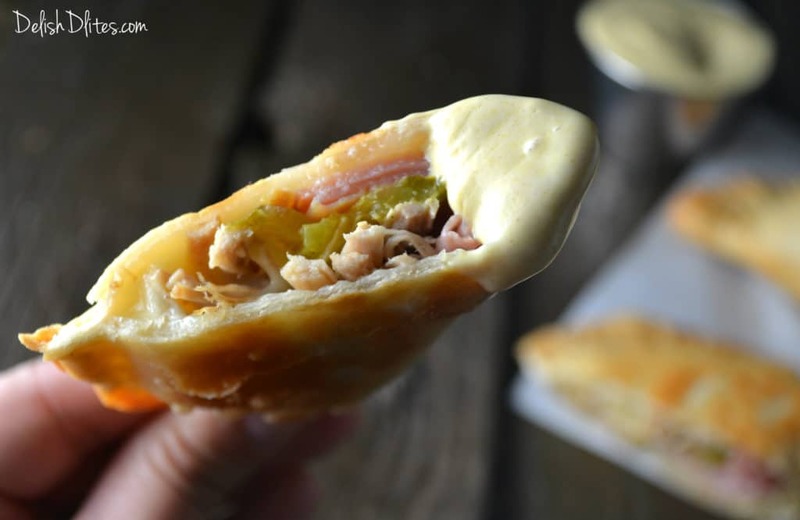 Dip the empanada into this tangy mixture to get a mouthful of Cuban sandwich deliciousness in every bite! 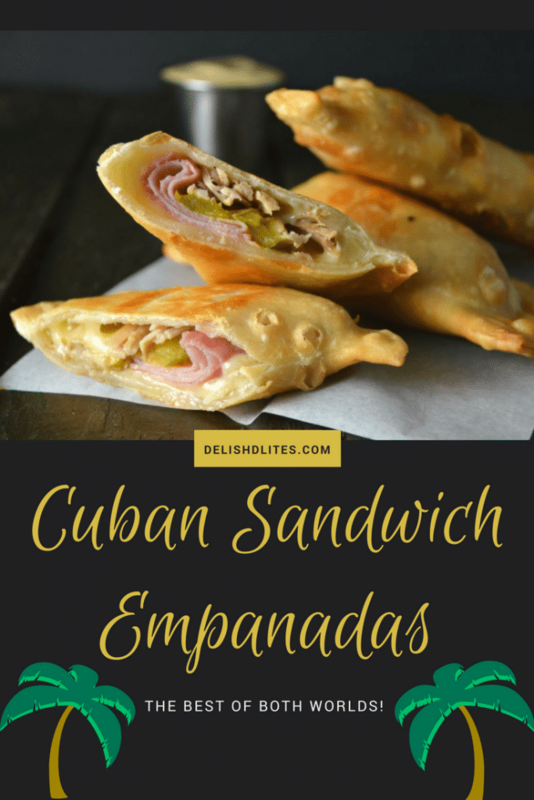 A delectable twist on a Cuban classic! Start by laying a piece of Swiss onto the empanada disc. 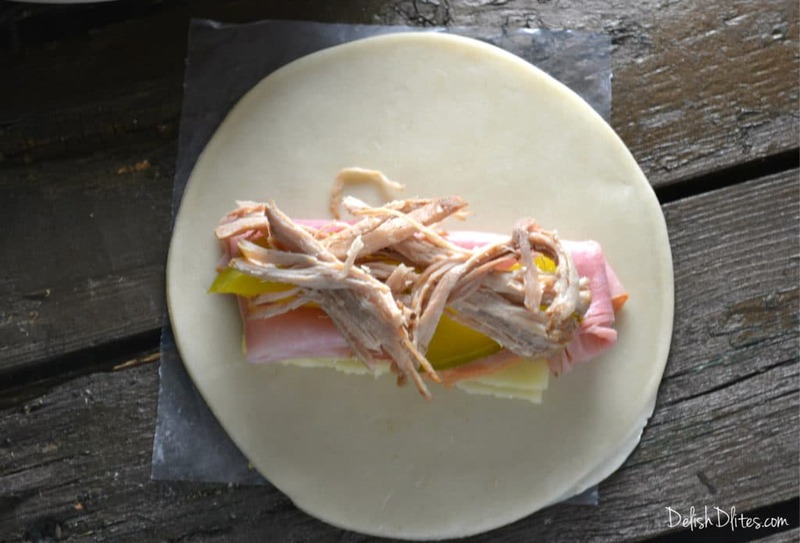 Add half a slice of ham, a bit of roast pork, and few slivers of pickle. You want a leave a border around the edges of the disc, so that you can seal it later. Heat up about 1 inch of oil in a pan to medium heat. Cook the empanadas for 2-3 minutes per side, until they're golden brown. Drain the empanadas and allow them to cool for 5 minutes before serving. They're super hot! To make the dipping sauce, mix the mayo and mustard together. Serve the dipping sauce along with the warm empanadas. Frozen empanada discs are found in most major supermarkets and ethnic stores. They usually come 10 to a package, so this recipe makes 10 empanadas. You can assemble these ahead of time, freeze them (uncooked) and store until needed. Fry them from the frozen state on medium heat, to keep them from burning on the outside before the inside heats up. can these empanadas be baked instead of frying? You’ll have to use empanada discs made for baking. They look good!! That’s so neat that empanada presser. Thanks Angelica! Yes I’m totally obsessed with my empanada fork…Check out http://www.empanadafork.com for product and order info!